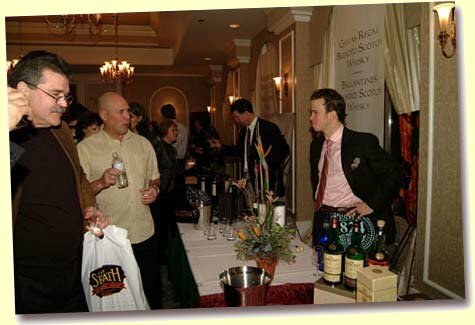 The second annual Victoria Whisky Festival, organized by Maniac Lawrence Graham and his partners, was held 24-28 January 2007. It was a five-day whisky event that began and ended on high notes. The tasting events and masterclasses kept everyone engaged and on the move. And the whisky? Well, I certainly got closer to a couple of memorable 40 year olds. The respectful and relaxed atmosphere created a terrific opportunity to meet and talk with industry leaders. I had a wonderful time and I can only thank Lawrence and his very capable team for hosting an extremely well organized and very personable Whisky Festival. The festival was also a lovely time to reunite with good friends and to meet a couple of new ones along the way. When I wasn’t attending whisky events, I spent my time sightseeing beautiful Victoria. It is a charming city to explore with its winding narrow streets and quaint shops. The festival hotel, the Grand Pacific, overlooks the beautiful Inner Harbour, which is surrounded by the snowcapped Olympic Mountains to the south, and the Cascades to the southeast. The weather was on our side with consecutive days of blue sky and sunshine. I have traveled extensively in Canada, and Victoria is undoubtedly the friendliest city in the country. Midweek, the festival was kicked off by Jim Murray, whisky writer and consultant blender, who hosted two sold out “extravaganza” whisky tasting events held on consecutive nights. As most festival goers weren’t arriving in town until Friday, I was impressed that Victoria could draw two full houses from the local populace. What a warm-up, indeed. Each night, Mr. Murray walked the attendees through a 14-whisky tasting session, reflecting his signature of presenting whiskies from around the world, including single malts, blends, grains, and vatted malts and bourbons. On one evening, the blind whisky tour began in Wales, with a dram of Penderyn, and continued until Ireland, Canada, the United States, and Scotland were respectively put on the map. Murray is quick to dispel one-dimensional notions that enthusiasts may have about whisky. He points out the merits of the various whisky styles and encourages questions and comments. Holding up one of the whiskies from the nights’ flight, he begins to stir the pot, asking, “Where do you think this is from?” Nosing their dram, participants pipe up, “Scotland, peaty, smokey…it must be Scottish!” “Islay, I know my Islays!” Within moments of nosing and tasting, the crowd has happily formed firm opinions of their “Scottish” mystery malt, until he waves before their eyes an emerald green bottle of Connemara, a peaty Irish beauty. Judging from the surprised laughter and lively chit chat, I am certain that all those gathered took home with them a greater worldly-wise appreciation of whisky. For all concerned, the Jim Murray Whisky Tastings were nights of discovery and substance. Friday night was the much anticipated Richard Paterson Whyte & Mackay Tasting which was appropriately labeled, “Fab at 40”. Whyte and Mackay are owners of Dalmore, Isle of Jura, Fettercairn and Tamnavulin distilleries. I had never been to a Paterson tasting before, and it was a good guess that I would be in for a few new tasting experiences. I was therefore quite keen to get underway. The evening was also going to be special because I was reuniting with friends and fellow Whisky Magazine posters, Mr. TattieHeid (Bruce) and Ron who was accompanied by his girlfriend. I arrived without too much time to spare, and Lawrence kindly ushered me to my seat next to my forum mates. Mr. Paterson, Master Blender, looking quite dapper and wearing his signature pocket handkerchief, sprang into action. In what seemed to be the most jam-packed few minutes of my life, Richard poured water from a silver pitcher onto the floor exclaiming, in the voice of a preacher at a revival meeting, “Uisge Beatha–the Water of Life”; spat on the floor while damning England (and apologizing to Jim Murray for doing so); and then threatened our lives if we held our glasses cupped in our hand, balloon style. A smile on my face, I settled in for the night. Richard guided us through a slide show presentation accompanied by a historical and contemporary narrative about whisky production (referring to the stills as the “Big Bastards”), the art of blending and of the whisky entrepreneurs from Glasgow, James Whyte and Charles Mackay. The Whyte and Mackay double red lions rampant seemed like pussycats next to their fiercely loyal spokesman and company blender of 36 years. I was fascinated by the story of the notorious Macgregors. The abridged story is that when the Macgregor Clan was forced to change their name, many adopted the surname Whyte. The whisky entrepreneurs took the Lion from the Macgregors’ crest and made it their emblem. The Lion allowed the Macgregors to move forward symbolically while maintaining their family identity without the notoriety. I will always think of this piece of history when I see a bottling of Whyte and Mackay. Picking up whisky No. 1, Richard Paterson walked us through his tasting regimen: “Now approach your whisky like you are approaching a person. Whisky has to reveal its inner self. Talk to your whisky: Hello. How are you?” He then took a sip and, on the count of 13, (mmm-ha, mmm-ha, mmm-ha), swallowed. Richard described the Whyte and Mackay double marriage system of bringing together malt and grain whiskies. He emphasized the importance of patiently allowing the whisky to linger on your tongue and letting the flavours shine through. Taking another sip of the 12 yo Dalmore, he described notes of smoke, marmalade, marzipan, citrus and spice. I appreciated what he was saying and most importantly the art of blending was not lost on me. But, Richard and I had reached an impasse on his anti hand-warming stance. So, listening to my inner self, I cradled my glass discreetly under the table. After all, the man was armed with a water pistol. I enjoyed the drams that were in front of me. It was a pleasure to begin with the 12 yo Dalmore. In the spring of 2005, in Ontario, the LCBO (Liqour Control Board of Ontario) dropped it from their inventory. I thought it was a loss because it is a very pleasant everyday dram and reasonably priced. My impression of the dram did not stray too far from the Blender’s. “Fab at 40”: The last two drams were very memorable. I know my notes don’t do them justice. I keep wondering how can I write “really, really good” ten different ways! 40 yo Dalmore, 40% abv Single Highland Malt: 1000 bottles produced at $3,500 per bottling. This was a rare opportunity to try something quite grand. Before we moved onto the final dram of the night, we were each given a small piece of chocolate at 86% cocoa fat. We were given strict orders not to taste either whisky or chocolate until the last piece of chocolate was dished out. To enhance the mood, the lights were dimmed. The plan was to kick back our whisky in one sweep and then drop the chocolate into our mouths for full effect. After a night of savouring my whiskies, it didn’t feel right to treat this “jewel in the crown” with unbridled abandon. I did as instructed, but once the deed was done, I regretted not following my gut instinct. The whisky was wonderful alone and found that the chocolate had overpowered the delicate flavours and smooth-as-silk mouthfeel. It was an important lesson to be reminded that amongst the advice from experts and friends, it is about trusting what is the best way for me to enjoy my dram. It never hurts to be reminded of this now and again. Saturday January 27th was a “celebration of whisky” day that began at 1:00 pm with the first Masterclass, and wrapped up in the early hours of the morning with a post festival party. The two events of the day were the afternoon Masterclasses, and the evening Media Event, Sponsors and Consumer Tasting. I was also looking forward to reuniting with more Whisky Magazine Forumners and good friends Badmonkey (Craig) and WestVanDave (Dave), and meeting forum members Ibacha (Len), Cam and Inanime (Matt) for the first time. All of the Masterclasses were sold-out. After each class, the friendly enthusiasts would swell the hallways waiting for their next class to start, all the while happily exchanging notes and stories with each other. This is where I first bumped into Dave and it felt wonderful to recognize a friend in the crowd. We didn’t have much time to chat as we were heading in opposite directions to our respective Masterclasses. Placed at each seating, a smart-looking and informative pamphlet gave a brief synopsis of the Glenfarclas history and tasting notes by George Grant, Brand Ambassador. Glenfarclas has been a family owned business since 1865, when the distillery was first purchased by John Grant. Mr. Ransom explained that Glenfarclas is a small company of 30 staff, and production remains computer-free. The Grant family continues to operate independently and strives for excellence by producing award-winning malts. During the presentation, Mr. Ransom also commented that J & G Grant had appointed a new Distillery Manager, Mr. Shane Fraser. Last year at the VWF during the Consumer Tasting, I sampled the Glenfarclas 17 yo and loved it. When I saw on the programme that there would be a Glenfarclas Masterclass at this years’ event, I just had to be there. I was delighted when the first whisky introduced was the 17 yo. I won’t review them all, but my two favourites were the 17 and the 30 yo. At the end of the session, in my modest notes, I had described the 30 yo as “velvety-creamy, marzipan-nutty! !” I think I liked it. A bottle of New Spirit was passed around for us to nose and taste. It was so sweet smelling and bursting with pear flavour. Overall, I really welcomed the opportunity to sample such a wonderful line up of Glenfarclas whiskies. A. Dewar Rattray is owned by family member Mr. Tim Morrison who is fourth generation descendent of Andrew Dewar. The companies focus is to bottle unique and exclusive casks of Scotch whisky. was distinguished by its region and unusual characteristics. It was a blast to contrast and compare the selection. The 30 yo CS Teaninich was my favourite. I found it delicate, and, as Craig would say, “damn good!” My tasting notes seemed to have trailed off mid-way through the selection as I sipped the whiskies and soaked in the ambience. The Stronachie 12 yo piqued my interest because it was a new release by the LCBO (Liqour Control Board of Ontario) in the autumn of 2006. This is a recreation of a historical whisky. James Cowan explained that Mr. Morrison owns one of the three vintage bottles remaining from this long-closed distillery. A sample was taken from the 1904 Vintage bottling, analyzed, and matched as closely as possible to malt from a modern distillery. The mystery distillery is a closely guarded secret. I left the Masterclass pondering Mr. Morrison’s fascination with the Stronachie Distillery. together at the evening’s Media Event, Sponsors and Consumer Tasting. Despite some frustrating and disappointing technical problems with his CD presentation, Mr. Douglas eventually found his groove and continued in a more personable fashion. I really liked him–he is a soft-spoken and genuine man who is refreshingly candid and critical on such subjects as the Scotch Whisky Association, of which Arran is no longer a member, and their attitude toward finishes. In his opinion, “quality scotch is quality choice,” full-stop. I enjoyed hearing his snapshot stories of how the Arran Calvados Finish came to be, and his journeys to the Chateau Margaux winery in France. Gordon Mitchell is retiring, and a new 3000-cask warehouse is being built. It will be first of its kind to be used in the whisky industry, modeled after a winery warehouse. Unfortunately, I didn’t have the chance to ask him about the difference between this and a traditional whisky warehouse, and what benefits he expected from it. This was Matt’s first time sampling whisky from the Arran Distillery. He was really impressed. Lawrence had kindly invited the forumners to attend the Media portion of the “Media, Sponsors and Consumer Tasting” that was scheduled Saturday from 5:30 – 6:30 pm. The Media Event and Sponsors is equivalent to the “VIP” portion that is offered by other festivals. I welcomed the opportunity to chat with industry representatives and to check out the nights’ whisky selection at a slower pace. The Consumer Tasting was scheduled a little later between 7:00 pm -10:00 pm. On the Festival website, the Consumer Tasting is described as “the heart of the Victoria Whisky Festival”. It certainly lived up to its billing, as the ballrooms filled to capacity with whisky enthusiasts and industry insiders representing “a selection of over 90 different whiskies from Canada, Scotland, Ireland and the United States.” Jim Murray, whisky writer, also occupied a booth and was kept busy through the night selling and signing copies of the Whisky Bible 2007. My drinking objective of the evening was to explore new whiskies, including variations of some of my favourites like Highland Park. The whiskies that I sampled were: Scotches: Glenlivet Archive 21 yo; Old Pulteney 17 yo; Hazelburn 8yo; Murray McDavid Highland Park 1989; Dewar Rattray 30 yo Tomintoul; Canadian: Potter’s Special Old Rye, Potter’s Distillers; Centennial 10 yo, (Rye) Highwood’s Distillers; France: Whisky Breton, product of France, bottled by Warenghem, Lannion-Bretagne 22300. I was told that the bottling could be purchased for $38 (Canadian) for 700ml in West Vancouver government store; Irish: Connemara, Single Malt Peated Irish Whiskey. They are Shelter Point Distilleries and Winchester Cellars. Both distilleries had booths at the festival. With its natural surroundings of glacier -fed water, sea air, and rich farming community, Vancouver Island is well suited to making great whisky. Shelter Point is a joint partnership between Jay Oddleifson (Vancouver Island) and Andrew Currie (Scotland). The Distillery will be located on the University of B. C.’s former experimental farm, a 700-hectare site outside of Courtenay, nestled by the Strait of Georgia. The farm will be a self-contained operation housing the distillery, warehouse and malting house, as well as growing barley. The whisky will be stored in American oak casks and the projected annual production will reach 50,000 litres, or roughly 65,000 750-millilitre bottles. Midway through the night, Lawrence had organized a picture-taking of the Whisky Magazine Forumners. Unfortunately, Craig and Matt were unavailable, but Bruce (Mr. TH), Ron and Elaine, Len (Ibacha), Cam, Dave (WVD), Lawrence and I had gathered in front of the camera for our photo op. As Forum members, we spend most if not all of our time communicating via cyberspace. The opportunity to exchange our whisky opinions with each other in person felt like a treat. The combination of world class whiskies and fine company amidst the beautiful atmosphere of the Hotel Grand Pacific makes this festival something to put on your “must do” list. Due to other obligations, I didn’t attend the Aberlour Distillery Dinner that marked the last night of the festival on Sunday January 28th. Mr. Ed Patrick, President of the Companions of the Quaich, was hosting this affair. Ed also lives in Toronto and leads our monthly Companion get -togethers. He is a very dedicated and knowledgeable whisky man whose jokes are not for the weak-kneed. From experience, I know without even attending the Aberlour Distillery Dinner, it would have been a wonderful time. There is no doubt that the Victoria Whisky Festival 2008 event will be sold-out again in record time, so I would recommend registering your name and contact information on the official website, www.victoriawhiskyfestival.com for advance notification. Next year’s Victoria Whisky Festival has been scheduled on January 25-27th, so mark it on your calendars and start saving your pennies. Hopefully, I will be clinking my glass with more of you next year.